sensations of the place were becoming blurred to my slumbering mind. I thought I was sinking into an abyss, which cut through the globe." 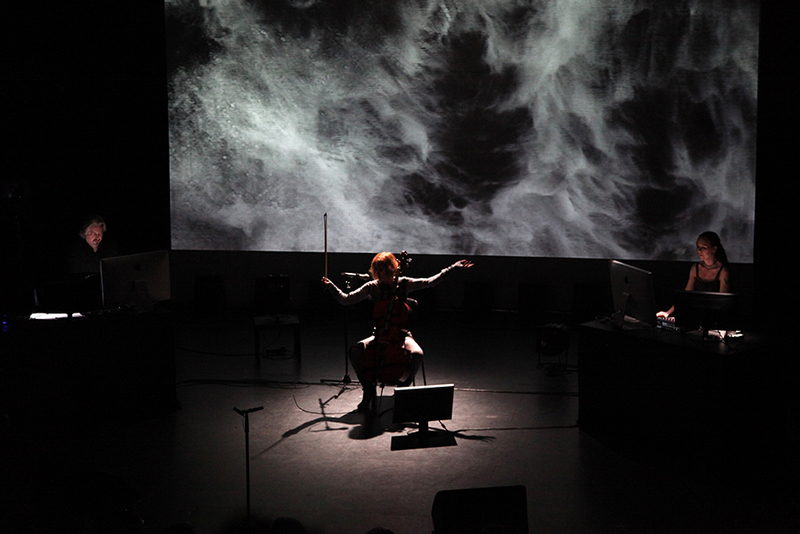 The cellist wears a set of inertial sensors on her chest, arms and hands. Each sensor includes 3-axis accelerometer, gyroscope and magnetometer that allow the tracking of her movements. These sensors, associated with sound analysis techniques (extraction of the frequency, the envelope, harmonic content, ...) and gestural interfaces handled by the two other interpreters, control software that (re)synthesizes and multiplies in real time sound and image. Combined, they increase the expressive possibilities of the instruments, defining new musical gestures and offering innovative writing techniques.